Titanium necklace in mainstream jewelry. 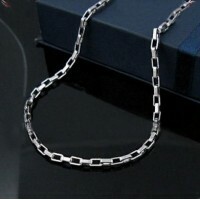 Description of titanium necklace, benefits, prices, places to purchase. Not all titanium necklaces are produced by PHI-TEN, as you may have thought if you browsed the net these days. In fact, PHI-TEN products may contain little to zero titanium, if you take a closer look. Necklaces have long been one of the most sought after products for both the consumers and jewelry artists probably since the first day a lady choose a beautiful flower to wear around her neck. This happened because a necklace is the single most prominent piece of jewelry that you can wear. One may hide a faulty, ugly looking ring, a cheap bracelet may be swiftly tucked under the sleeve, but there is nothing you can do to put a necklace away from the prying eyes. You may have heard about a thing called “The Manhattan look”. Supposedly it’s a special gaze that is used by the ladies when meeting a companion of the same gender to rapidly asses and evaluate the quality, branding and season of the clothing they are wearing, the total and exact value of the jewelry items displayed, including the authenticity and carat estimate of that shiny diamond on the engagement ring. 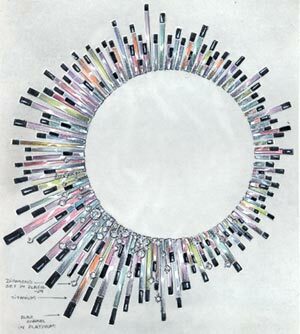 For ages, a necklace has been the jewel that supported the most of the heavy burden of the Manhattan look. Women knew that, and demanded more and more work and value to be added into this type of jewel. I think this is the reason why the most beautiful and precious jewels are found among the necklaces made in different periods of time. Of course, it actually may have been just something that men invented in order to have a reason to leisurely take a look under a lady’s chin, without suffering some unexpected and rather harsh consequences. Being the newest contender in the very competing jewelry market, titanium could not possibly overlook this masterpiece of the domain. Titanium necklaces have some properties that help them make a statement in the industry, but also some weak points that prevent them to rule the market. On the plus side, titanium necklaces benefit from the lack of hypoallergenic reactions, which maybe quite a crucial factor, as the neck is one of the most sensible part of a lady’s skin, not to mention that a necklace causes the greatest skin exposure from all other pieces of jewelry. The corrosion resistant factor is also a main benefit. A necklace made from titanium doesn’t change its appearance, degrade, blacken or rust when entering contact with different substances during normal wear, such as sweat, moisture from the atmosphere or different cosmetics products that may have been applied on the skin. In the same note, a titanium necklace can easily be worn with a bathing suit, as sea or swim pool water have no effect whatsoever on this metal. But the specific toughness and hardness of titanium doesn’t fit as well with titanium jewelry in general. The metal cannot be so easily worked, so you should not expect the fragile and intricate designs that you may have seen on products made of other softer metals. The usual approach is a rather simple, repetitive, chain like pattern, which also naturally lead to the marketing of titanium necklaces especially to men. The price of a titanium necklace may vary from tens of dollars to some hundreds, depending on the quality of the workmanship involved and the sheer quantity of the metal used. Of course, special orders that involve use of other alloys, such as platinum or gold, or precious stones are evaluated accordingly, and prices in the range of thousands are displayed frequently. Nevertheless, some impressive results can still be achieved with titanium. In this image you can see “The Chameleon” of Pallavi Dudeja Foley from Bangalore, India, second runner up in the 2004 World Titanium Council Jewelry Design Competition.